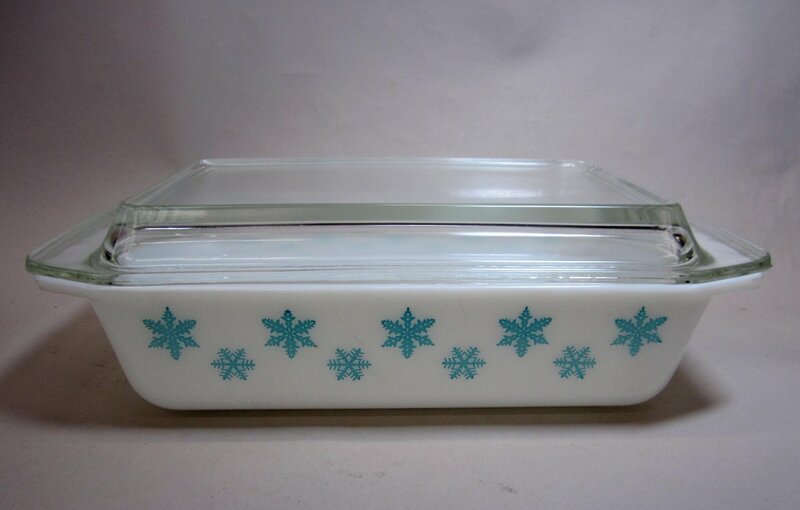 Snowflake, along with Pink Daisy, was released in 1956 as the first printed pattern on the opal PYREX line. The clear covers were meant for multi-purpose use, either as a trivet to protect the table or as an additional serving dish. Snowflake was also part of the Turquoise line. Snowflake was introduced in 1956 along with Pink Daisy. While Pyrex had been producing solid color opalware for several years, Pink Daisy and Snowflake were the first patterned dishes to be released using the new screen-printing process. They were introduced as “NEW Pyrex Decorator Casseroles” and quickly gained a market with consumers. One of the selling points of this new casserole dish was its clear cover, meant to be used not only as a cover but as a trivet to protect table surfaces. It could even be used as an extra serving dish. Snowflake was released in three versions. The longest running color combination was a white pattern on a turquoise background. However Snowflake also came in a turquoise pattern on a white background, and a white pattern on a charcoal background. While the white on turquoise version ran until 1967, the turquoise on white was produced until 1963 and the charcoal version was produced until 1960. In 1963 a new product line called “Turquoise” was released, which included both Butterprint and Snowflake in the white pattern on turquoise background. The same blue tint was used in both product lines. Later the “Multitone Blue” 300-series bowl set was added to the Turquoise collection. In 1972, a pattern called Snowflake Blue, sometimes called “Garland” by collectors, was released as part of the Compatibles line. Snowflake Blue had a pattern of snowflakes, dots and swags that resembled a garland.